Alex's Ultimate Panfish Recipe - WELCOME TO JAMES GANG FISHING CO. Step 1 - Go kayaking in the boundary waters of Minnesota. Find Trevor Meeks on an island. When he is passed out, possibly from alcohol consumption or just too tired from paddling, dig in his cooler and steal all the 11" bluegills. If you are unable to go to the BWCA, just go ice fish Potato Lake in Rusk County, WI and limit out on crappies in about 20 minutes and go home. Step 2 - Remove your stove from your house, or sell it on Craigslist. Go outside and start a wood fire. If you don't have a firepit, you need to start making better decisions in life. At this point all you can do is place some charcoal in the bottom of your grill. Once the coals are hot, place wood on top of the coals, so you can't taste the charcoal. Step 3 - Throw out all of your wife's "non-stick" cookware. Get out the cast iron skillet, fry two pieces of bacon on it. Remove the bacon and eat them. Pour a small amount of peanut oil in the bacon grease. The purpose of the peanut oil is to raise the smoking point of the butter. Step 4 - Place a small amount of butter in the center of the peanut oil. We are not fans of greasy, gut-wrenching fish fries, we like the taste of panfish, and we sure don't try and over coat them and deep-fry them to hide the flavor. 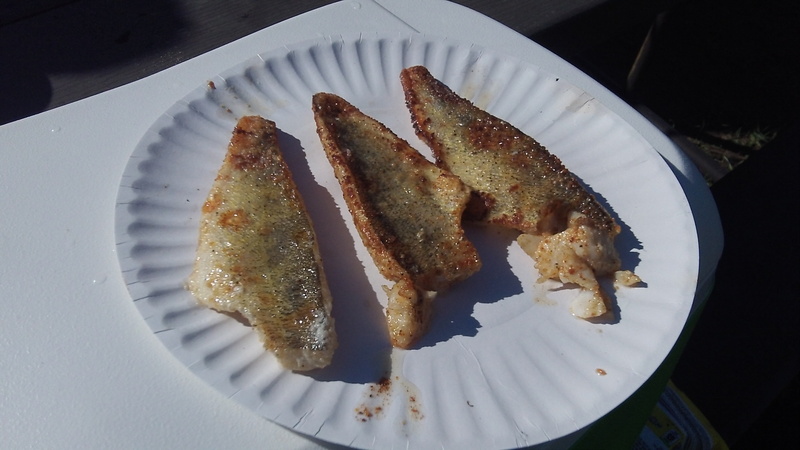 As the butter melts into the peanut oil, take your bluegill and crappie fillets and lightly season them with cracked peppercorn. Follow this with a light coat of nature's seasons, then a light dusting of garlic powder, and then finish the seasoning with a VERY LIGHT coating of Andy's Breading. Remember, we don't want a batter, we are BRINGING the fish flavor OUT to you, not masking it. Step 5 - Place your fish fillets into the center of the cast iron skillet. Do not flip the meat until the bottom half of the meat is fully cooked. It will take on a fully white color when it is cooked. When the bottom half is 100% white, you can then flip the fillet. After a few minutes your fillet should be ready. The fish will be a beautiful golden brown with a slight crispiness to it. Step 6 - Remove the fillets, and serve with red potatoes and your favorite beverage. Take pictures of the delicious meal and text the pictures to Trevor Meeks and make him upset. Try and cheer him up a few minutes later by reminding him of his mad fishing skills and the fact that most of us are not capable of catching giant bluegills like he can. ​Step 7 - Devour the greatest tasting food on the planet.